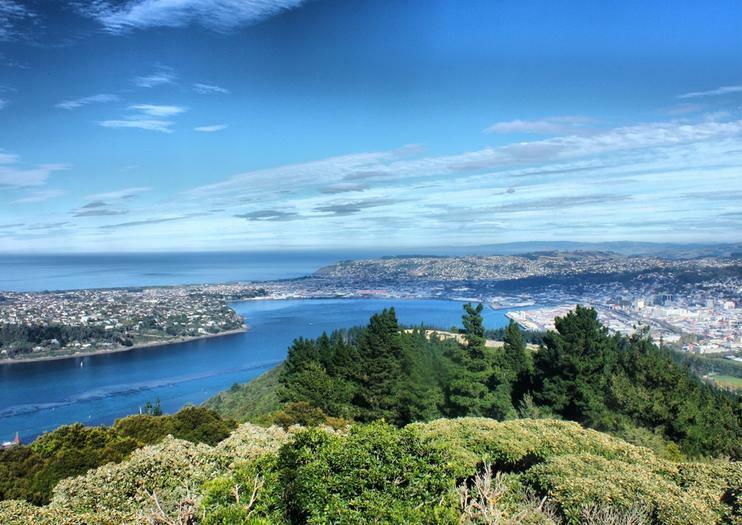 On a sunny day, you’ll find the best view in all of Dunedin is from the top of Signal Hill. This 1,289-foot forested promontory rises high above Dunedin Harbor, and offers sweeping views of the blue Pacific and green of the surrounding hills. On clear summer days you can find locals and visitors enjoying the uphill stroll to the summit, and mountain bikers whirring down the numerous trails that weave their way through the woods. While walking maximizes the hill’s beauty, there’s also a road that winds its way up to the scenic reward at the top. Not far from the Signal Hill summit, a large memorial commemorates New Zealand’s 100th anniversary that took place in 1940, and two bronze statues on the side of the memorial are an ode to the original Scottish settlers who founded the waterfront town. Signal Hill is approximately 1.5 miles outside of the Dunedin City Center. There is no admission to the summit or walking trails, and even on fine, sunny days, the top can still have a brisk wind that warrants bringing jacket. Let someone else take care of logistics while you experience the beauty and rich heritage of Dunedin and the Otago Peninsula. Spend the first part of the morning exploring parts of Dunedin, then take a scenic drive along the Otago Peninsula, stoping at one of the world’s only mainland colonies of Royal Albatross. Explore the city of Dunedin with a knowledgeable local guide who takes you to points of interest where you can stop and have a look around. See the Olveston House, Cadbury World and the University of Otago. Enjoy views of Otago Harbour from the lookout point on Signal Hill, and drive down steep Baldwin Street. Pickup and drop-off is available from hotels, the cruise port or the Dunedin Railway Station. Numbers are limited to 15 people for a small-group experience, with personalized attention from your guide. Experience the beauty of Dunedin and the Otago Peninsula on this full-day tour with a small group. Enjoy the personalized attention and plenty of time to ask questions that comes with traveling in a small group. Travel in a minivan to several bays and beaches, then visit the Albatross Center for some independent free time. In Dunedin, visit the First Church, the Botanic Garden, and the Railway Station, among other highlights. Explore Dunedin highlights on a 3-hour, small-group tour that goes from the city's historic landmarks to the beaches of the Otago Peninsula. You'll see the University of Otago, the Dunedin Railway Station, and more, then continue to the beautiful Otago Peninsula, pausing for a walk on St. Clair beach and esplanade. Group size is limited to 13 people to ensure personalized service, and this tour includes pickup and drop-off at Port Chalmers, with departure times that are tailored to cruise ship arrivals. Combine a city highlights tour of Dunedin with a wildlife-focused tour of the Otago Peninsula in a single day. Perfect for first-time visitors or those short on time, this tour covers both urban and natural highlights of the area. Landmarks in Dunedin include the Botanic Garden, Baldwin Street, the Dunedin Railway Station, and others. Get to know the Otago Peninsula's beaches and bays with scenic drives and a wildlife boat cruise from Taiaroa Head. Sightsee around Dunedin on a privately tailored tour that gives you the flexibility to choose your stops and duration. You’ll travel with ease aboard a Mercedes minivan during a scenic drive through the countryside. Check out the sights of Dunedin with specialized commentary and don’t miss a trip to the Otago Peninsula. You will be joining a small group tour and go to places that bigger buses cannot go.You will have personalised attention and will see the most special parts of Dunedin and Otago peninsula. With this tour you will enjoy a small group experience with a personalised attention while discovering the beauty of Dunedin City and Otago peninsula. You will avoid wasting time waiting for a bog group to get on and off the bus.You will be introduced to the city in the best way, optimising time to see the highlights of the city, enjoying the most breathtaking scenery of Otago Peninsula via Highcliff road where the road for bigger buses is not suitable.You will have a 1 hour guided tour of Albatross Centre and discover all about these huge seabirds.